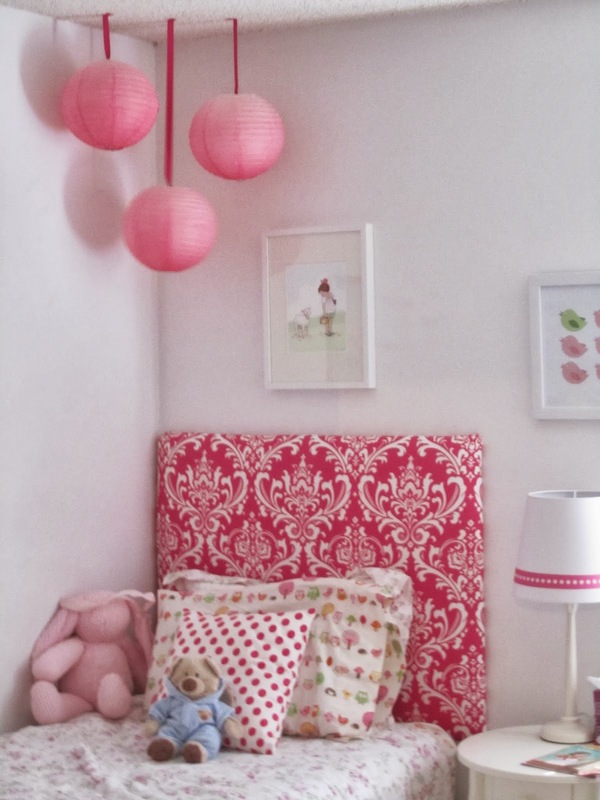 Swoon Style and Home: Little's Room: Posters and Butterflies and Lanterns, oh my! Little's Room: Posters and Butterflies and Lanterns, oh my! Ahhh. Crossing things off my project list feels so good! After a really long hiatus from house projects, I have been making great progress: first with finishing up my picture wall over the TV in the den and then with finishing up things around Big's room. Next up on the list: Little's room. Little's room looked pretty good when I started. But I wanted to make it better. It had art on the walls, but I pretty much just threw things up when we first moved in to make her space feel homier for her. I knew I wanted to eventually "finish" the space. 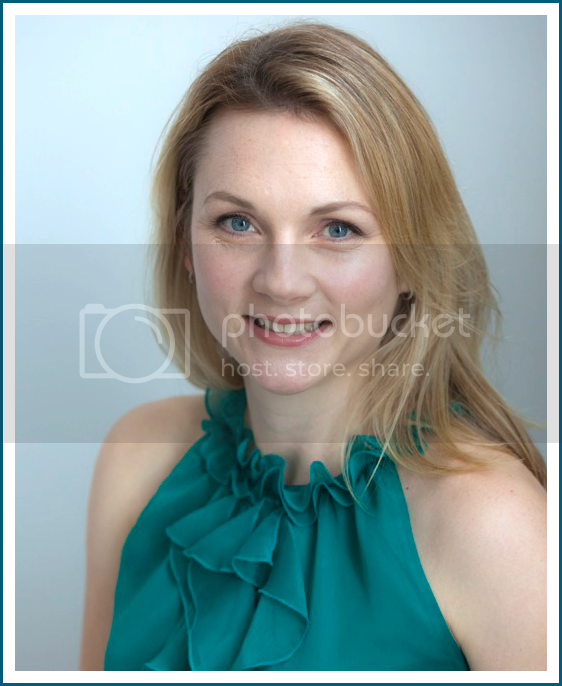 And here it is after a little more work! I let Little pick out some of the art, while I picked out other pieces. It should come as no surprise that she wanted a princess poster -- one that had "blue Jasmine with the bikini" (sigh). I want her to love her space and I want it to feel like hers, so I agreed but insisted that we frame it. OCD in the house! I hung it next to her bed. Next up was the space over her bed. I found some pink paper lanterns in the party supply section at Target and hung them over her bed in a cluster. 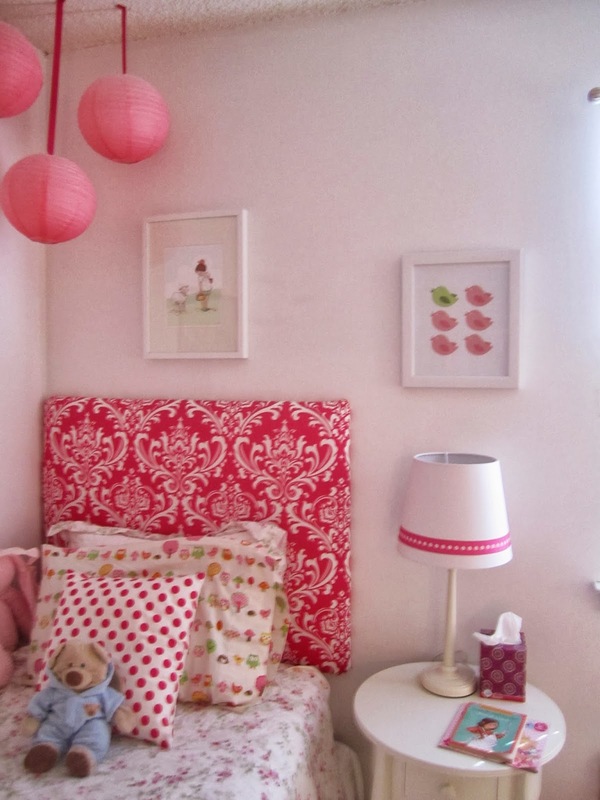 I put her Little Lamb print over her bed and the cute birdie print (also from Target) over her nightstand. Next: a mirror. I wanted a really girly ornate frame for her mirror, and I found this on Craigslist for $15. The gold is temporary: I am going to paint it (and a bunch of other spots in her room) lavender for her. But I wanted to put it in its place so I could decorate around it. 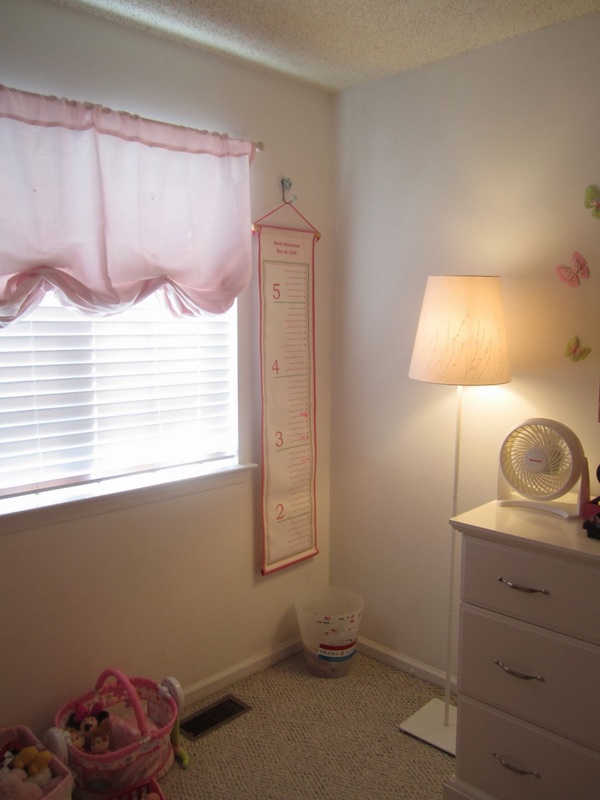 The sweet fabric butterflies around the mirror are from Pottery Barn Kids. I got them after Christmas for $5. I've been holding on to them since then. While I was at it, I hooked up her floor lamp to the lightswitch. It required a bunch of extension cords and cord covers, but now when she turns on her lightswitch, there is a lot more light. I put her growth chart near the far wall too. I love it in this space. I hung it from a hook that I bought a really long time ago from Anthropologie. 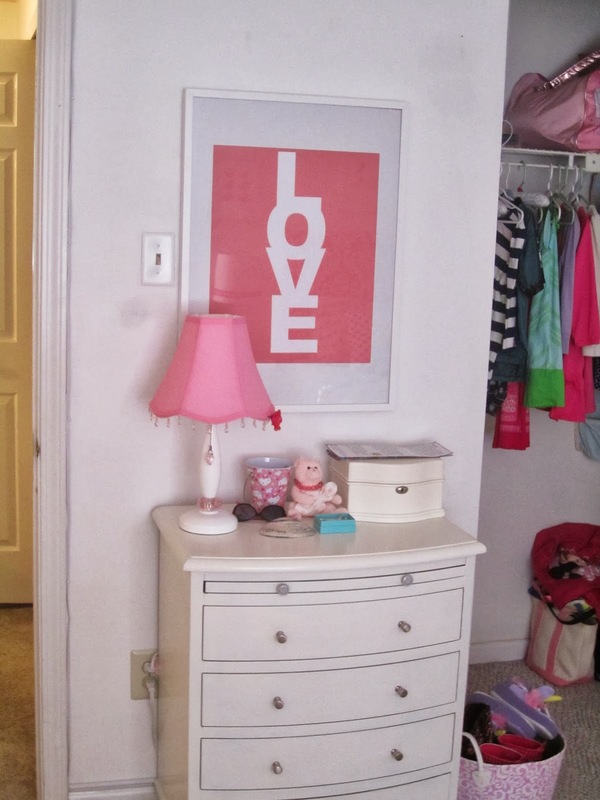 Here's the spot over her little chest right near the door: I bought a LOVE print by Made by Girl (love her stuff. love) and framed it with an IKEA Ribba frame. Done. This print is so appropriate for my little Little - she is so loving and any time she writes her name or my name or any family member's name, she follows it with "love." It melts my heart. And finally, here is her bookshelf area. I bought the wall shelf from Home Goods last Summer (as in 2012) and it didn't work in the spot where I planned to use it. So I hung onto it. I bought the brackets from Home Depot and popped it into place. I'm not done decorating the shelf. 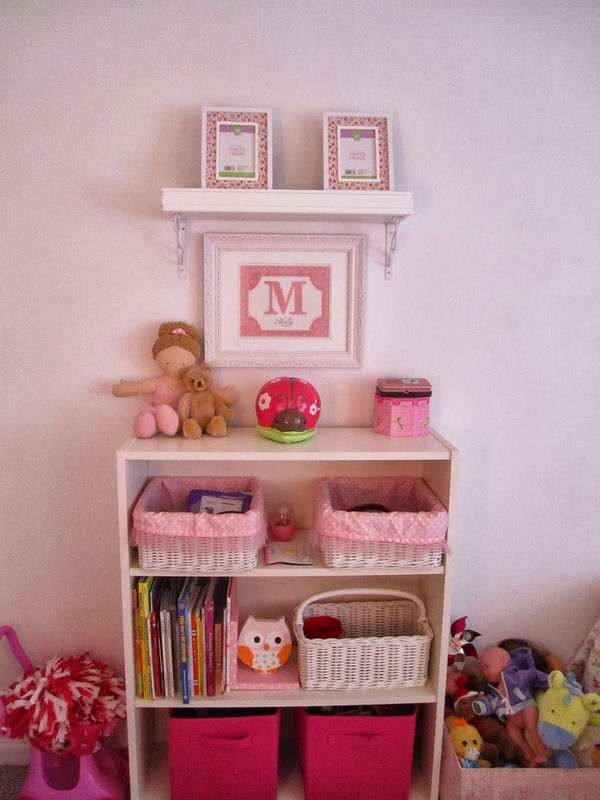 The frames are from Target and I have cute Strawberry Shortcake prints to put in them. I'll do that soon. Here is a rare action shot of me putting up the shelf, taken by one of my rogue photographers. That's it for now! I still have some work to do in here. I need to paint the backs of her bookshelf (lavender) and paint the mirror lavender too. And I need to put something in the corner by the window. But I can check this one off my list for now. Next up: a little finishing touches in my own bedroom and a slew of painting projects.